Jam Marmalade is one of the most common spreads used during breakfast. Making it at home can be a tad complicated, but there is nothing like freshly made jam marmalade with fresh citrus fruits. The first step is the selection of fruit. The peel should be edible when raw and should be high in pectin, the jelly-like fruit protein that causes jam to set. In this recipe Seville oranges have been used. Select jar which have absolutely no scent and residues of the last product they contained. Wash them thoroughly, remove them thoroughly and let them dry. Then sterilize the jar by putting them in an oven. Peel the skins of all the citrus fruits in such a way that the fruit underneath in not damaged. You can use a spoon to aid in the peeling the peeling process. Collect the peels and the fruit in separate bowls. Cut the peels into small pieces as per your liking and cook them all to extract the zest and the oils. Now extract the juices of the fruit by using a sieve so that the seeds don’t mix with the juice. Do not throw the pulp away. It is needed to extract the pectin; done by boiling. The next step involves the boiling of mixture of juice, peels and the pulp. To ensure that the pulp does not mix with the juice and peels, use a mesh bag. Add 500 ml of water into this mixture and let it boil for 45 minutes to one hour. Use a wooden spoon every five minutes to squeeze the mesh bag so that all the pectin gets released into the mix. Keep on cooking until the peels get translucent and soft. After the initial boiling, remove the mesh bag and squeeze all the sticky juices out of it. Now add 1Kg of plain white sugar and boil for nearly ten minutes till the solution gets thicker and darker. Keep on boiling till you feel that the marmalade has achieved the required consistency. You have to taste and check. Now pour the marmalade into the jars which are still warm. 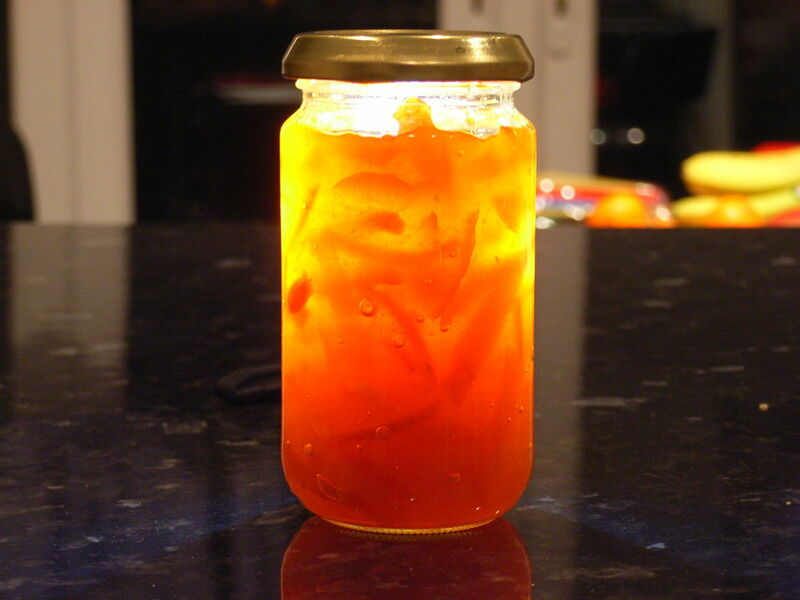 Pour hot marmalade and close the lids because it ensures a vacuum and you can store the marmalade for longer periods.